Swiss manufacturers of Electric Chain Hoists, Jib Cranes and Lightweight Crane Systems, GIS are one of a kind. With brand history dating back over 50 years with many of their first hoists still in operation- just one of the many reasons to choose GIS. Spare parts are always on the shelf and ready for overnight despatch, the GIS hoist range is made with precision. 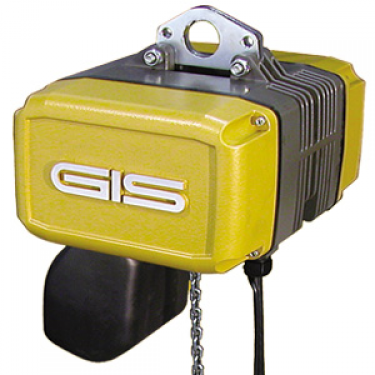 GIS are also well known for their range of single phase electric chain hoists. 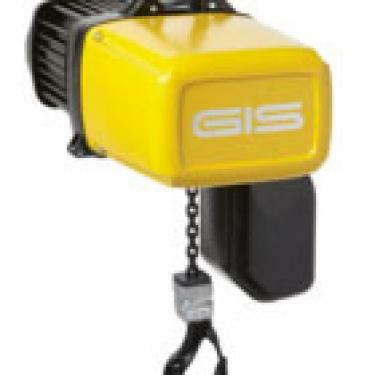 GIS Electric Chain Hoists are manufactured in Switzerland to the highest standards of quality and technology. With capacities from 40kg-5,000kg GIS match a hoist to nearly every purpose. GIS take safety very seriously- each hoist is fitted with several safety devices to prevents accidents and overload such as low voltage pendant controls, overload protection devices, geared limit switches to prevent the hook from travelling further up or down than intended (these are very accurate and can be set within millimetres). Easy to operate and reliable during extreme conditions, GIS are the first choice for many companies that operate hoists with intense usage as they feature very high duty ratings and long heights of lift up to over 120m. Expertly designed and perfected in Switzerland for over 50 years the GIS range is well balanced to provide the most user friendly lifting experience with confined dimensions to enable maximum hook path in a well enclosed aluminium casing while still providing adequate ventilation to the hoist motor. The first speciality before hoists for GIS in 1957 was precision mechanical products- this set the foundation for the development of one of the most robust and precise hoists on todays market, the quality of every GIS hoist is impeccable and is unmatched by inadequate impersonations. As a testimony to the quality of the GIS hoist range we are proud to say that we have supplied spares to GIS electric chain hoists that are almost 50 years of age and still operating efficiently with only standard components being changed due to wear and tear as expected with any product over such a long period of time.